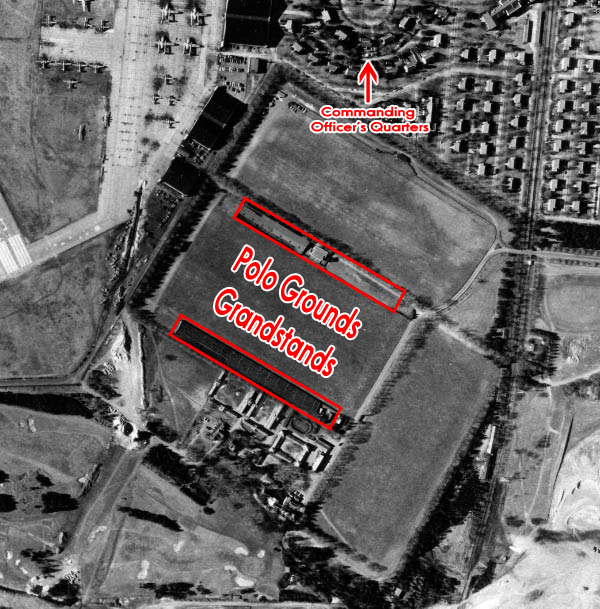 Lee Chambers: To get a sense of just how large the new grandstands were in 1926, notice how they extend much farther southward to the border of the airfield. The International Polo Field was the scene of numerous American victories in the early 1900's. Today, a good amount of the property is used by Nassau Community College's new campus. 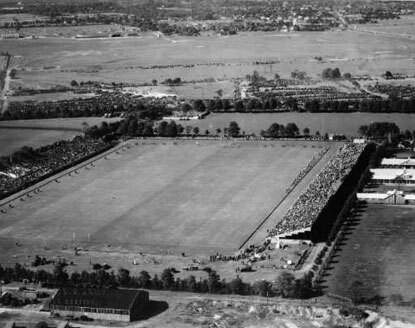 Lee Chambers: In May of 1931, some of the additional buildings behind the eastern grandstand were present. 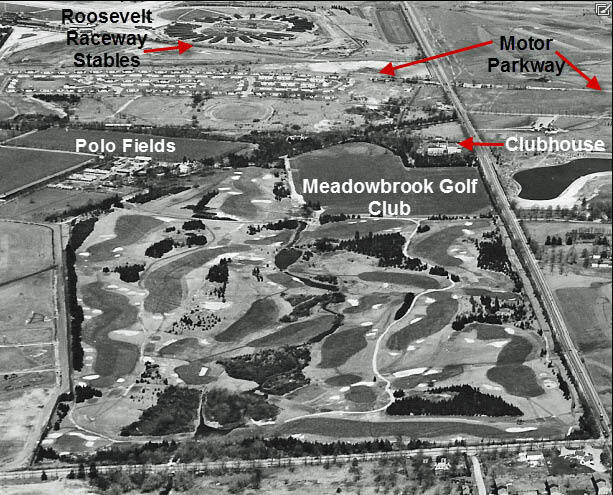 Lee Chambers: A 1949 aerial from your 2013 post from before the Meadowbrook Parkway slicing (pun!) the golf course in half. Lee Chambers: From 1955, the surviving grandstands. Notice how the field had not yet been divided up into multiple baseball diamonds. The Commanding Officer's Quarters that I grew up in can easily be seen within walking distance of the field. 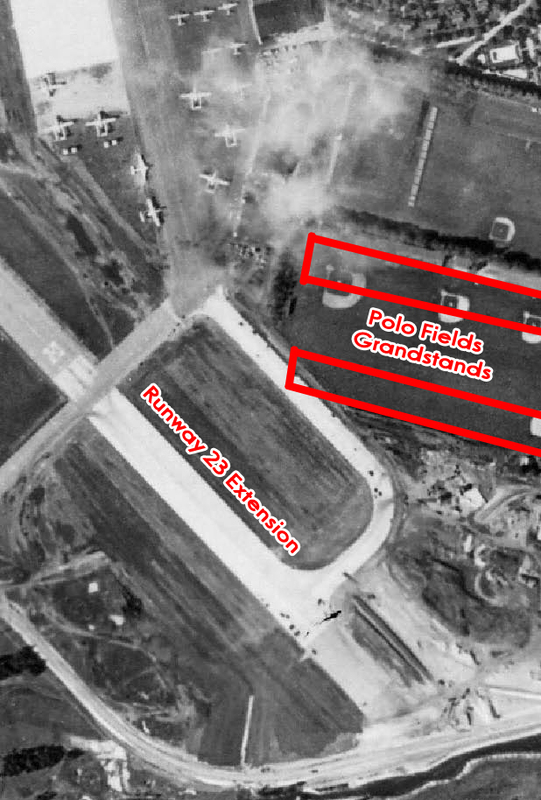 Lee Chambers: By November, 1956, the Air Force had taken over the property, torn down the grandstands and created baseball fields which would be used later by Nassau Community College prior to construction of the new campus. 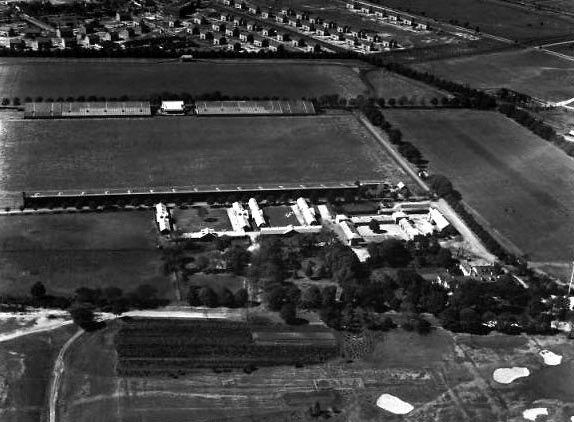 In 1966, Nassau Community College won the National Junior College championship on the largest of those fields seen to the left. Lee Chambers: From your 1/08/18 post, the additional rectangular buildings, almost certainly stables behind the eastern grandstand are obvious in this shot. Lee Chambers: A 1932 aerial from your 01/08/18 post: Judging by how large the trees in the area had become, and how they obscured the view of buildings such as the Meadow Brook Club. This was taken quite a while after the 1924 aerial. Lee Chambers: Don't know how I missed this last January. 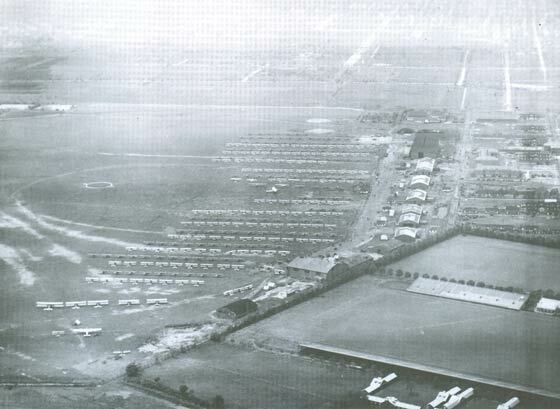 Here's a close up 1932 shot of Mitchel Field from Mystery Photo #1 with an overlay of the roads not yet constructed while the Base Reconfiguration of 1927 - 1932 was well underway. My house is clearly visible in the center of the yet to be constructed Rice Circle. 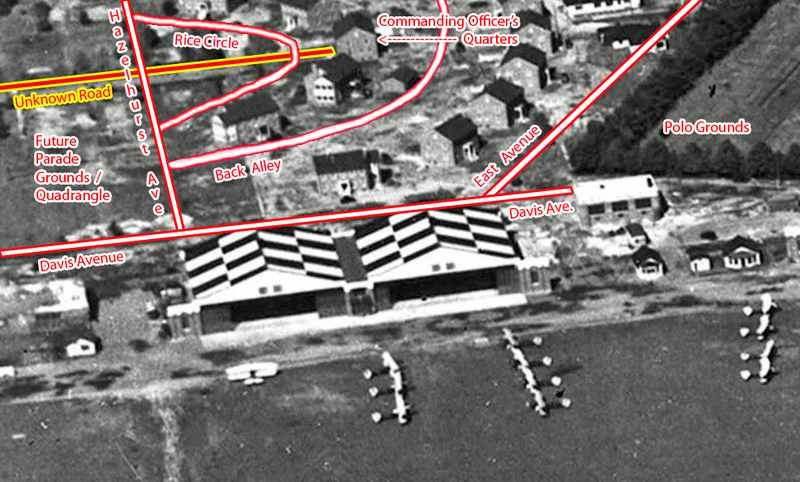 There once was a road running West to East across Camp Mills that bisected the area that would later become the Parade Grounds / Quadrangle (which was covered with old wooden buildings leftover from WW1 at the time) and which ran parallel to both Miller and Davis Avenues and ran as far East as the aptly named, East Ave. along the Westernmost border of the Polo Grounds property. I have never been able to find a name for this road outlined in Yellow. Do you or anyone in the group know what it was called? I believe you are correct about Chestnut Street in East Garden City and the unknown road running through the Base. From left to right, West to East, it’s easy to see how it once crossed Oak Street (Oak Street was originally Avenue E on Camp Mills. It would seem likely someone with a proclivity for trees renamed the local streets after Camp Mills was decommissioned following WW1). Continuing Eastward, Chestnut (or whatever it was known as at the time) continued across West Road on what became Mitchel Field. From there, it went directly through the site where the Hospital would be built on (what else), Hospital Road (the same building that still houses NCC’s 90.3 WHPC-FM in the basement that used to be the morgue where I got my start in 1976!). Following its Eastward trajectory, the road then bisected the expanse that would be turned into the Parade Grounds / Quadrangle which was at the time was still covered with wooden buildings left over from the WW1 Camp Mills era. From there it split the very property where I would later grow up in the Commanding Officer’s Quarters, then dead-ended a few yards later at East Road along the border with the Polo Grounds property. Although I have found vintage street maps of Mitchel Field while it was an active Base, I have as of yet not found one for Camp Mills. Does anyone know of a source that might contain the original name of Chestnut and all the other streets in East Garden City that once were part of Camp Mills?